Luke's Note: We're joined again tonight by Patrick Wyatt, a games development legend and former Blizzard executive who has played a big role in the success of games like StarCraft, Diablo and Guild Wars. This is the second part (you can read the first instalment here) of his insider's story of the making of Warcraft, which he knows a thing or two about, since he was both Producer and Lead Programmer on the game. If you're a fan of Warcraft, its universe, Blizzard or just video game history in general, it's a great read. In my previous article about Warcraft I talked about the beginnings of a series that would come to define Blizzard Entertainment and lead it to being one of the best-known and most-loved game companies in the world. But how did Warcraft go from an idea to a full-fledged game? Let me tell you, it was not a straight-line path from conception to launch. As with many games the design evolved over time, with ideas being argued, tested, argued, changed, argued, retested and some eventually killed. You probably gathered that there was a lot of arguing along the way, but that's not always a bad thing. While sometimes they devolved into ad hominem attacks, hard feelings and apologies, the debates ensured that ideas were likely to be well-forged. And even through the disagreements, there was a sense of camaraderie that pervaded our efforts. We worked together, played together, partied together, slept 10 to a hotel room for trade shows together, and in cases even lived together: I shared a house with three other Blizzard-folks which was the first of many similar dorm rooms scattered throughout Orange County, California. Blizzard was working on at least four other games when I started on the Warcraft project, and as the company numbered only 20 everyone was mega-busy keeping those projects on track. It wasn't uncommon for artists, programmers and designers to be working on two or sometimes three projects at a time, and of course our sole musician/sound-engineer, Glenn Stafford, worked on everything. But we regularly found time to meet in large groups to brainstorm and discuss company strategy, so much that we called our efforts the "business plan du jour". I already discussed our motivation to create a Real Time Strategy (RTS) game modeled after Dune II in a previous article, but one other key idea propelled us forward. The other impetus for the game started with a proposal that Allen Adham - president and company co-founder - made during one of our brainstorming sessions. He wanted to build a series of war games that would be released in near identical white boxes under the banner "Warcraft", with subheadings announcing the historical context for each game: The Roman Empire, The Vietnam War, and so forth. The goal with the identical boxes was to control a large section of shelf-space that would be easy for players to spot in a crowded retail environment, similar to the Gold Box series of Dungeons & Dragons games from SSI, which enjoyed great success during the late 1980′s. New players would be drawn to the section of games by its dominating shelf-presence, and veteran players who enjoyed one game they would know where to find the next. I know; retail: so archaic compared to app stores and Amazon, right?!? 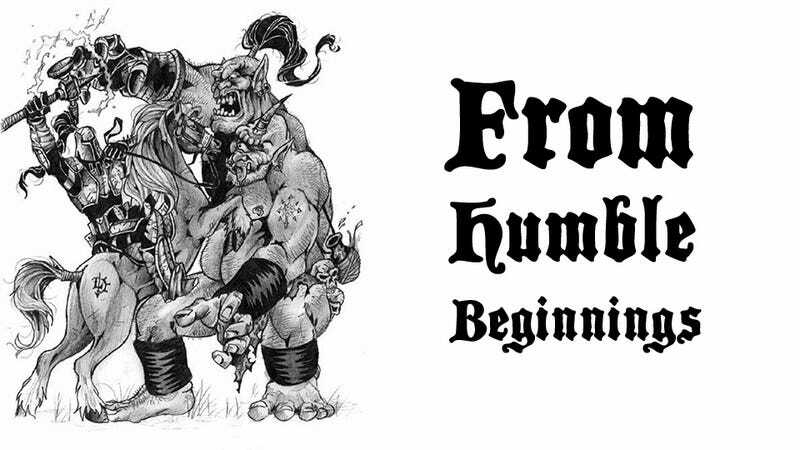 Ron Millar and Sam Didier, two of the early artists to work at the company, weren't excited about the idea of working on historical simulations, they enjoyed fantasy games like Warhammer and Dungeons & Dragons. One glance at Sam's artwork is enough to demonstrate his passion for the fantasy milieu. So at a later meeting they proposed the idea that the first game should be set in a high-fantasy world of Orcs and humans, where they'd have more opportunity to create innovative game artwork instead of being required to conform to the tenets of historical accuracy. The idea took hold, with the first game in the series becoming Warcraft: Orcs and Humans. Many people believe that a game designer is solely responsible for all idea conception and actually "creates the game design", and this may be true for some development teams. Designers do need to be highly creative and bring to life many of the elements of the game personally. But equally important is for designers to be receptive to the ideas of others: without some involvement in the game's design the rest of the team has less motivation to do their best work. And beyond that, it's never possible to know where the next great design idea is going to come from. It's critical for designers to listen so that the best ideas of others aren't stifled. Our informal design process during the early period of Warcraft's development worked effectively in that regard. Many brainstorming sessions occurred during hallway meetings, lunches, smoke-breaks, and after late evenings of game playing. Everyone in the company contributed their thoughts. With little formal process and no single design document, the game design evolved with each passing month. Ron, who had started his career in the game industry as an artist, was at that time our go-to guy for design on Blizzard games. Though he was finishing up the development of Blackthorne, a side-scrolling shooter for Super Nintendo, he devoted time to generating ideas for the game. Stu Rose was another artist who became one of Blizzard's early staffers. From a personality standpoint he was the polar opposite of Ron in most respects, and his efforts as part of the design group occasioned conflicts of opinion with Ron, though during the times they did agree they were an unassailable force. These two ended up as the book-ends for the entire design process, each working independently to develop the world's culture and plot overview, define the game's units, specify the play mechanics, envision how magic spells worked, develop the game's missions, choose place-names, and finalize other minutiae that are nevertheless important to make games comes to life. At this late date it's not possible to document who developed exactly which idea without canvasing the entire team and sorting out arguments over events that happened so long ago. Even back then we had difficulties determining how game-design credit should be shared, and ultimately decided the fairest, most egalitarian solution was to credit everyone, and thus the Warcraft: Orcs vs. Humans box credits include "Game design by Blizzard Entertainment". Incidentally the Moby Games credits for Warcraft 1 are completely borked because they mix the much later Macintosh and 1998 releases of the game with the original 1994 DOS release, so many folks are mis-credited. While my recollection of the exact timing of events is dim, I've recently seen an early design document dated 1994 and labeled "Chaos Studios", which means it was generated in early 1994 before the company had been renamed Blizzard. By February 1994 we had a set of (still very rough) design documents that had been through several iterations and contained the key concepts for the game. Admittedly, it would probably have been better to have a design in place before I started programming in September 1993, but with the amount of "substrate" that I needed to build before the actual fun-n-game parts could be developed, the lack of a design wasn't a show-stopper at that stage, particularly since we already pulled many of the game's elements from Dune 2. While it's still (barely) possible to play Warcraft 1 today, it's not much fun compared to later RTS games. The difficulty of getting the game running on modern computers leads one to high expectations that are then crushed when viewing a game with a screen resolution of only 320×200 pixels - one twentieth of the resolution of a modern high res monitor - and with user interface and play balance that are markedly inferior to our later efforts. But by playing Warcraft 1 it is possible to see the ideas that survived through the design winnowing process into the game's final release. In many ways Warcraft 1 isn't so much different from later games in the series. Today gamers are familiar with classic Warcraft units like Barracks, Town Halls, Lumber Mills and Gold Mines, all of which survived into future releases of Warcraft games. Those iconic units persist because their names and functions are easily comprehensible to those of us who live in the real world instead of Azeroth. But many of the ideas that our early design documents contained didn't come to fruition. Some of this was related to the brutal timeline - the game had to launch for Christmas, 1994 and we barely made it. Ideas died because better alternatives existed, or didn't have strong advocates, or were too time-consuming to implement, or would have required too much memory, or weren't fun. I thought folks might like to know about ideas that ended up on the cutting room floor, like the Mason's Hall [required for stone buildings], Dwarven Inn [greater production of stone], Elven Fletcher [upgrades for archers], Tax House and Ale House. These buildings all served secondary functions, some of which could be combined elsewhere. We instead added their functionality to existing buildings instead of creating buildings solely dedicated to one function, as for example the Dwarven Inn and Elven Fletcher buildings. The Mason's Hall was dropped because we considered using stone as a third resource (in addition to gold and lumber) an unnecessary complexity. We revisited the idea again for Warcraft 2, and dropped it again after actually implementing (programming) the idea. The Ale Stand was designed to increase the rate at which soldiers and gold would be produced. I'm not sure how we can rectify that design idea with the amount of work that actually gets done after a night of heavy drinking in our world, but I imagine there are special rules of magic at work in Azeroth. Or maybe that's why we cut the Ale Stand. And NPC races like lizard men, hobgoblins and Halflings were also on the drawing board but were ultimately rejected, almost certainly due to the effort of drawing and animating the figures in DPaint. Game development is about trade-offs - great games don't have to do everything, they have to do a limited number of things well. A design idea much discussed but never implemented was "formations", where units would stick together on the battlefield. Formations are difficult to implement so the feature was chopped from the spec. Some of the complexities that prevented implementation: units in formation all move at the same speed so slow units don't get left behind - this created programming complexity. Formations need the ability to rotate - or "wheel" in military parlance - so that a formation heading north comprised of infantry carrying pikes with archers following behind can turn as a group to face an enemy detachment approaching from the east, with the archers still lined up behind the protective wall of infantry - this created user interface complexity. Given enough time we could have completed the feature, but we needed the development time for more basic features. As a stand-in, I did implement "numbered group selection". A user would select a group of units and press the Ctrl (control) key plus a number key (1-4). Those unit-groupings would be remembered so it would be possible to later re-select those units by pressing the number key (1-4) by itself. But those units would move independently even though selected as a group. Another idea much discussed but never implemented was that of having a unit that represented the player on the game map: an avatar that would progress from mission to mission during the game. For a game-avatar to represent the player, it should morph from a weak unit into a mighty hero over the course of several missions to create a sense of progression. To do this properly would require that the character would only become more powerful if utilized. An underutilized avatar would remain weak, while an avatar constantly at work on the front lines would become stronger. Carrying a unit over from one mission to the next adds to the difficulty of play-balancing missions. A great player will graduate a strong avatar from each mission, and that avatar's strength will make succeeding missions seem easy, while a less-skilled player's avatar could be so weak as to make winning later missions impossible. These two problems would lead players to drop out of the game - in the first instance for lack of challenge, and in the second due to frustration, as few players want to go backwards and redo previous missions in order to survive a mission later in the game. A competitor's product named War Wind released several years after Warcraft allowed units to be carried over from mission to mission; the game's designers allowed up to four units to be transferred, but finessed the play-balance problem by ensuring that these units weren't powerful enough to affect gameplay, somewhat the antithesis of what a heroic player-avatar is supposed to represent. Heroes - in Warcraft 1?!? We also considered including hero-units in Warcraft 1; they had names like the Illusion Thief, Barbarian, Huntress, and Juggernaut, each with specialized skills. Ultimately we trimmed the list of game units substantially; probably due to design and art-animation time constraints. As someone with limited involvement in Warcraft III, it was interesting to see the idea of heroes finally implemented in the series, though the design genesis of heroes in Warcraft III comes from a different source - that is, not from ideas re-hashed from Warcraft 1 design documents. Briefly, Warcraft III started out as a game called Heroes of Warcraft, which departed from the type of traditional RTS we had already launched five times before (W1, W2:ToD, W2:BtDP, SC, SC:BW) and was instead a squad-based tactical combat game set in the Warcraft universe. This game morphed into a more traditional RTS - but retained the element of heroes - after a change of team-leads halfway through the development. If you consider the artwork of the Warcraft series, you'll see that the colors are shockingly loud in comparison to, say, Diablo, where only in a dim room is it truly possible to see the beauty of the art. The bright, cartoony art-style was different from the style of many other PC war games of the era, which hewed to more realistic color palette. Part of that difference can be explained by the past experiences of our artists, who had worked on several Super Nintendo and Sega Genesis console titles, where games required more dynamic colors since televisions of that era were so much worse at displaying colors than PC monitors. Console games on TVs, which had lower pixel resolution and color bleed, needed high-contrast artwork to show well. Another reason was at the behest of Allen, who charged all the artists with drawing artwork in bright conditions. He'd regularly stalk the halls of Blizzard turning on lights and opening window-blinds. His view was that most folks play games in bright rooms, so our artists should be authoring our games to play well in that environment. He argued that it's easy to draw artwork that reads well when viewed in a dark room with no outside light can distract from the monitor. But when computer art is competing with bright lights it's much more difficult to see. And fluorescent bulbs are the worst form of light available - the cold, flickering glow of their tubes tires the eyes and washes out colors. So the lights were always on in the art rooms to force artists to compensate for terrible lighting by creating art that accounted for those conditions. These working conditions chafed on some (all?) of the art team, but ultimately led to artwork that stood out compared to products of the day. Now you know why Warcraft artwork looks like it has been candy-coated! In the first article of this series I promised to address a bunch of topics in this article, but I've written another long post and didn't quite make it to those points; I'll continue to press forward in future articles. But give me a wee bit because I've become addicted to DayZ and need more play-time! As a game developer with more than 22 years in the industry Patrick has helped build small companies into big ones (VP of Blizzard, Founder of ArenaNet, COO of En Masse Entertainment); lead the design and development efforts for best-selling game series (Warcraft, Diablo, Starcraft, Guild Wars); written code for virtually every aspect of game development (networking, graphics, AI, pathing, sound, tools, installers, servers, databases, ecommerce, analytics, crypto, dev-ops, etc. ); designed many aspects of the games he's shipped; run platform services teams (datacenter operations, customer support, billing/accounts, security, analytics); and developed state-of-the-art technologies required to compete in the AAA+ game publishing business. He blogs over on Code of Honor, which is where this story originally appeared (republished with permission). Total Recall is a look back at the history of video games through their characters, franchises, developers and trends. You'll find Total Recall stories every Tue-Fri between 1am -2am Eastern.